I have worked with Multi-Family Floors for the last 4-years and can tell you this if you need a quality job and on-time then they’re your company. Tony, Daniel, and the entire team always go above and beyond with whatever requests I need. Customer Service is top notch and their installers are always going above and beyond. I have had the distinct pleasure of working with this group of professionals for decades now. Throughout that time, their owners and leadership has been consistent in their care of their customers—always providing a pleasant and reliable experience. And when the chips are down, and there is some type of unfortunate disaster, you can call on them, and they will be there for you, and you can count on that. In short, they are a key component in our successful operations, and we appreciate the relationship. Working with Multi-Family Flooring has been a consistent professional and stellar customer service experience. Having managed many new apartment development projects as well as multi million dollar renovations and large client portfolios, their services have been an integral part of my success. Tony and Multi Family Flooring have partnered with Empire to complete flooring installation in over 600 units and counting in the low country in the last 18 months. Multi Family Flooring has always provided accurate and timely quotes, directed us to great, affordable products and provided installations that are both “on time” and of good quality. They have provided us the crews we need, when we need them, and they help make our projects successful. Vice President, Empire Corporation of Tennessee, Inc.
From top to bottom, there are few companies in Charleston that are as good to work with as Multi-Family Flooring. The Sales Department is knowledgeable and helpful- they make sure you get the right product for your needs. The Installation Crews are courteous, efficient and thorough. The work well in both vacant and occupied units. They treat residents with the utmost respect. The Billing Department is proficient and friendly. I have worked with Multi-Family Flooring for 8 years on multiple projects and I have always been pleased with the product and work I have received. 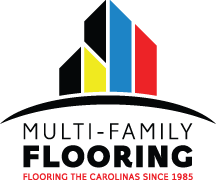 I highly recommend them for all your multi-family flooring needs!